As the days grow shorter and the temperature drops, we once again pause to thank you for your prayers and your financial help. Our work is in your hands. As you�ll read, it�s been a busy autumn for us, and we have changes (and challenges!) ahead. Please continue to keep us in your prayers, and we promise to remember you and your intentions in ours. �CLASS WING� (left) KNOM education director Mike Nurse and inspiration director Lynette Schmidt hold the mission�s Gabriel �Radio Station of the Year� Award. It is the tenth time that we have been honored by the Gabriel, which is the highest honor a radio station in the United States can receive for extensive local programming that is based upon spiritual and positive human values. In Universal City, CA October 19th, general manager Tom Busch accepted the statuette on behalf of our staff and also on behalf of you and all of KNOM�s benefactors. Among the audience of 500 was a cheering section of twenty-two KNOM staff, contributors, families and friends. Tom noted that KNOM is the only small station to receive the top Gabriel. In the award�s 37-year history, all of the other winners have been large, high-budget stations in big cities. HEAR! HEAR! If you have access to the Internet, you can now listen to KNOM spots, a couple of Eskimo Stories and Legends programs, Eskimo music, a rotating sample of our daily �KNOM Profile� interview show and a 15-minute sample of our programming! They�re available on our web page at www.knom.org/realaudio. The sounds are in RealAudio format, which most modern computers equipped with speakers will play automatically. We hope that you greatly enjoy them. Please consider adding missions like KNOM to your will. We place all bequests into funds dedicated to future major improvements or to keep the mission strong during future emergencies. INSPIRATIONAL SPOT: Old age, senior citizens, the elderly. God�s children who once entered life to the excited cries of �it�s a boy!� or �it�s a girl!� May their sunset years also be filled with celebration by our kindness and our caring. 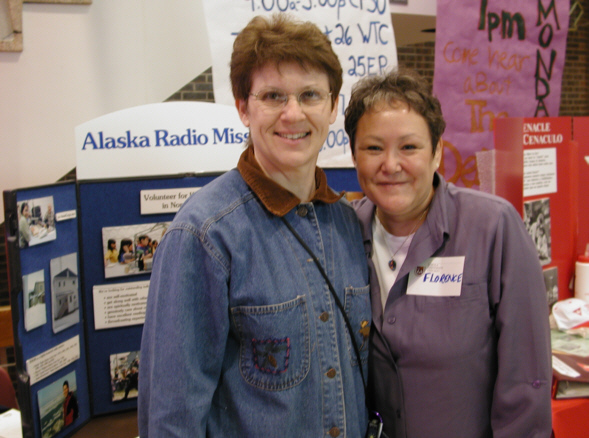 top SMILES: (left) We warmly welcome the return of 1998-2000 KNOM volunteer Kelly Brabec. Originally from Fremont, NE, Kelly deejays the 4 � 7 PM shift on weekdays. In addition to her work at KNOM, Kelly is a full-time counselor at Nome�s youth correctional facility. When she�s not working, Kelly enjoys traveling, outdoor sports and painting. This year, she hopes to take advantage of the Nome winter by learning how to snow shoe. Welcome, Kelly! 30%? 50%? EVEN MORE? Nobody knows how many western Alaskan families are torn apart by the horrors of domestic violence. There is no question, however, that violence against spouses and children occurs far more frequently in this region than in any other place in the United States. Over the years, we have devoted hundreds and hundreds of hours of air time to this devastating problem. We have succeeded in our first objective, which was to make every adult in this area aware that hitting or threatening a spouse is not normal. As you probably know, a person who habitually hurts a spouse or child is most likely to have suffered abuse when young. KNOM continues to work to end this cycle of abuse. We provide victims hope by letting them know the options that are available to them, such as seeking safe shelter. We encourage the batterers to find help, and show them where it can be found. We promote the healing process by which victims, both old and young, can overcome the terrible effects of their psychological trauma. Last month, KNOM news director Paul Korchin and his deputy, volunteer Julia Dunlap, produced what turned into an enlightening and extremely emotional call-in program on the subject. One village woman called to thank us for helping others in the difficult task of facing this problem. That�s all she could say when tears overcame her. She thanked us again before ringing off. Thank you so much for your support of our work, as we attempt to improve the lives of those around us. INSPIRATIONAL SPOT: When I look at a sunset or a wild flower, I never look for imperfections. What would happen if I approached people that way? top GIVING CREDIT: An increasing number of KNOM benefactors ask if they can contribute via credit card. Also, our friends increasingly request that we include a reply coupon with this newsletter. Right now, we are determining how to do so most economically. Soon, we expect to be inserting coupons that can be used for contributing by credit card, as well as by check or by cash. In addition, we will be able to offer our benefactors the opportunity to contribute via credit card using a secure server on the Internet. Thank you to everyone for your suggestions, requests and ideas. Please watch for these, and let us know what you think. NURSING ALONG: While recruiting for volunteers at Loyola University in Chicago, Tom and Florence Busch were happily surprised to see former KNOM volunteers Joanne Cagney Prorock, RN (1976-7) and Jane Schraufnagel O�Connor, RN (1976-7/1978-9, (left, with Florence.) Both women and their families live near the campus and just stopped by to say hello. Between 1968 and 1993, a total of sixty-six nurses and four doctors lived as KNOM volunteers, contributing their entire salaries toward the operation of the mission. Without them, KNOM would not have been possible. The nurses� presence peaked in 1980, when seven of these generous young people contributed 62% of KNOM�s income. Soon after that, a nationwide shortage of nurses emerged. By 1986, KNOM was down to one or two support nurses a year. Fortunately, by then, contributions by mail had risen to cover 64% of KNOM�s expenses. Today, as you know, individual donations comprise 94% of KNOM�s operating income. Gifts like yours arriving by mail are the mission�s life blood. Please join us, and take a moment once in a while to pray for the intentions of these wonderful nurses and doctors. They kept KNOM on the air, and were a strong, positive presence in our volunteer community, for many years. throughout 100,000 square miles of remote, roadless village Alaska - thanks to you. INSPIRATIONAL SPOT: Keep your face to the sunshine and you will not see the shadow. top FAMILY TIES: Volunteer Amy Flaherty (left) prepares to interview Elsie Boudreau of Anchorage, who flew to Nome to mediate a plan of care for a child who was in the state�s custody. It�s a new optional process in Alaska, involving discussion by everyone involved: attorneys, social workers, and the child�s extended family. According to Elsie, having as many family members as possible take part is a major factor in how well a child�s situation can improve. Elsie, by the way, is Florence Busch�s sister, a Yup�ik Eskimo born in the village of St. Marys, about 175 miles south of Nome. The interview, a �KNOM Profile,� aired in late October. If you have a computer with speakers, you can play it back from our web site's RealAudio page, www.knom.org/realaudio. THIRTY YEARS AGO: November 1972, gale force winds lashed the KNOM antenna with salt water spray and burned several two-foot long insulators. It was a periodic problem that dogged the station until 1976. That month, the University of Alaska began compiling a complete set of the 70 mimeographed issues of the �Nome Static.� Checking records, volunteer Therese �Tweet� Burik discovered that there was no Transmission 65 earlier that year; due to a mistake, May�s #64 had been followed by June�s #66. BRRR! October 6th brought Nome's first appreciable snowfall. Amid lots of laughter, the KNOM crew enjoyed a good-natured free-for-all snowball fight....Nome�s record low temperature for November is -39° F. Here�s hoping that the frigid 1948 record will stand! We thank you once again for your wonderful help that broadcasts the Mass and the Rosary, thousands of inspirational spots, and education and healing throughout this vast region of Alaska. May God greatly bless you for your kindness. Thank you! INSPIRATIONAL SPOT: Look at the design of a woven basket. From the simplest basket to the most complex, the ribs must be centered and held in balance. If the ribs are out of balance, the whole basket will be lopsided, uneven and off-center. Just like a woven basket, our life�s journey must have a fixed bearing: Christ.